Let’s examine the evidence, shall we? Remember: anger, fear, aggression — the dark side are they. This chart considers duels only between Force-adept antagonists (which eliminates the battle between Obi-Wan Kenobi and General Grievous). Luke Skywalker Darth Vader The good guy In a fit of rage! Qui-Gon Jinn Darth Maul Stalemate Darth Maul appeared to have the upper hand before Qui-Gon was whisked away. Obi-Wan Kenobi Darth Maul The good guy In a fit of rage! Yoda Palpatine The bad guy Yoda would have won… if he hadn’t simply left. WTF?! Obi-Wan Kenobi Darth Vader The good guy How good is a “good guy” who leaves his mutilated, helpless one-time friend to die in agony? The record is not too favorable for the good guys. 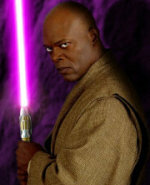 In fact it looks like the only good guy who wins while acting like a good guy is Mace Windu! You see, this cat Mace is a baaaad mother– Shut yo mouth! But I’m talkin’ ’bout Mace! Then we can dig it. Happily, my son Jonah bucked the odds recently when he battled Darth Maul to a draw under the guidance of his teacher, Jedi Knight Tiere Kai, when the Sith Lord paid a surprise visit to Jedi Training Academy.